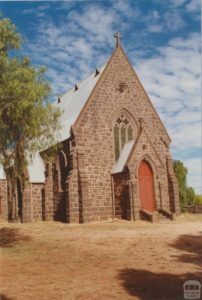 In 1865, the St Lawrence Catholic church (1874), of English Gothic bluestone design was built. Barfold: 1st Sunday of each month ( Revised program for January 2018 – Sunday January 7th at Barfold at 10am followed by morning tea. Sutton Grange: 4th Sunday of each month (except Sunday 4th December – Special Christmas Service – Sunday December 17th 7pm and New Year Service – Sunday January 28th 10am followed by morning tea. Morning tea is served at each of these Uniting Churches at 9.45 am and services start at 10 am and finish at 11 am. (unless revised program) If there is a 5th Sunday in the month, services may be found at Kyneton.